An indulgence, in Roman Catholic theology, means that temporal punishment (punishment here on Earth) for sins which have already been forgiven is taken from the sinner. The indulgence is given by the church after the sinner has confessed and received absolution. 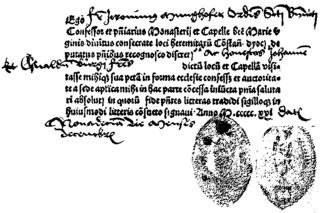 Indulgences replaced the severe penances of the early church. Martin Luther protested against them because they were sold. This was the starting point for the Protestant Reformation (1517). ↑ That can be all the punishment or part of it. ↑ Code of Canon Law, (Cann. 992-997) Indulgences; Enchiridion Indulgentiarum, 4th ed., 1999. "Indulgences", in the Catechism of the Catholic Church.